We all know that tea drinking has its perks! A hug in a mug, tea doesn’t disrupt our sleep, which means a late night cuppa can be enjoyed guilt-free. But not all teas are created equal, which is why all of Bestow Beauty’s teas are herbal blends crafted from 100% certified organic tea leaves. Organic tea has been grown without the use of synthetic fertilizers, herbicides and pesticides, which means toxic-free tea that’s better for you, better for the environment and better for the tea plantation workers. That’s what we call a win-win-win! Skin health starts from within - when your insides are happy, it shows on the outside! Tea is a superstar in the natural skincare world as it is packed with vitamins and catechins that work to slow signs of ageing, stimulate collagen production and maintain healthy skin cells. And by default, the water you’re consuming when you drink tea will also keep you and your skin hydrated! Ready to make the switch? Read on to find out how Bestow’s organic herbal teas can become a part of your daily self-care ritual and benefit your wellbeing and your skin. While caffeine stresses and depletes your body, this delicious blend provides hydrating nutrition to support healthy, luminous, youthful skin! With a bright, yellow colour and a mellow, earthy taste with subtle lemongrass zing, Puritea contains 100% organic turmeric, ginger, lemongrass and cinnamon. Turmeric aids your liver’s natural purification processes, helping your skin to become clearer and brighter, while ginger lowers blood sugar levels and has anti-inflammatory properties. Our bodies do a great job of telling us when something has upset our tummy and that uncomfortable bloated feeling that makes you want to don some trackies and curl up on the couch is never fun! Avoiding the types of food that cause this feeling is your best bet, but did you know that drinking tea is another way to help fight the bloat? Tea helps relieve bloating by stimulating your bile duct – allowing for better digestion and preventing bloating from reoccurring. 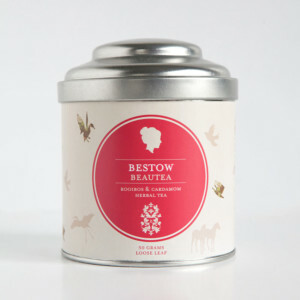 Bestow Beautea supports beautiful skin by encouraging beautiful digestion! A rich blend of 100% organic rooibos, cinnamon, ginger, clove, nutmeg, cardamom and black pepper, this blend has an earthy, red colour and works to aid digestion, promote nutrient absorption and kick start detoxification. While some women are not affected at all by their monthly cycle, others are left experiencing acne, anxiety, bloating and cramps. But there’s help at hand, thanks to the magic of green tea which has the power to lower anxiety, stress, inflammation and estrogen dominance - leading to happy hormones! Bestow Luminositea harnesses the power of 100% organic green tea and pairs it with 100% organic white tea – resulting in a blend with a pale colour and gentle flavour that promotes a healthy hormonal balance and provides you with a boost of hydrating antioxidants that help prevent the breakdown of collagen and elastin in the skin. While there’s still no cure for the common cold and flu, hot tea has long been known to ease the symptoms and teas containing ginger, lemon, cinnamon, hibiscus and cayenne are known to relieve respiratory infection symptoms and boost the immune system thanks their high antioxidant content. Bestow Eternitea has a pretty pink colour and a tangy flavour thanks to 100% organic hibiscus and cinnamon, and is rich in vitamin C to boost the immune system. Hibiscus is an antioxidant powerhouse that helps combat the ageing effects free radicals have on your skin, while cinnamon helps to stabilise blood sugar which prevents collagen breakdown, making this tea a powerful skin defender! With so many delicious blends to choose from, find your favourite today and drink your way to good health!